32, of Carrollton, Virginia, died Jan. 22 of wounds sustained from small arms fire in Uruzgan Province, Afghanistan. Beale was assigned to 3rd Special Forces Group, out of Fort Bragg, North Carolina. The Pentagon on Wednesday released the name of an Army Green Beret who was killed Tuesday during combat operations in central Afghanistan. Special Forces Sgt. 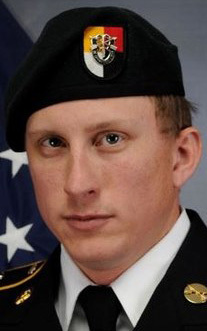 1st Class Joshua “Zach” Beale, 32, died in Uruzgan Province after succumbing to wounds sustained from small arms fire. He was assigned to 3rd Special Forces Group, out of Fort Bragg, North Carolina. This was Beale’s fourth overseas tour, and his third tour to Afghanistan. Beale was a native of Carrollton, Virginia, and had more than seven years of service in the Army. He graduated with a Bachelor of Science degree in criminal justice from Old Dominion University in 2008 and enlisted in 2011. He attended basic training and airborne school at Fort Benning, Georgia. Beale then graduated from the Special Forces Qualification Course in 2013 and was subsequently assigned to 3rd Group. His awards and decorations include three Bronze Stars, a Purple Heart, a Meritorious Service Medal, the Army Achievement Medal, the Afghanistan Campaign Medal, the NATO Medal, the Special Forces Tab, Ranger Tab, Parachutist Badge and the Combat Infantry Badge. Beale was posthumously promoted to sergeant first class. Beale’s death comes less than a week after Sgt. Cameron Meddock, an Army Ranger, died from wounds he suffered while conducting combat operations in Afghanistan’s Badghis province. The Taliban are also currently holding peace talks with an American diplomatic team in Doha, Qatar, in order to reach a political settlement to the conflict in Afghanistan.